The tarantula spider by fascinations provide you a lifetime of fun. 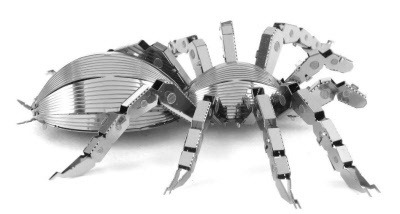 Build your own tarantula spider from this 3-D model kit. This could include all the instructions and comes as a flat piece of metal with popout pieces for you to assemble on your own. You'll love the detail that each one of these arachnids comes with. 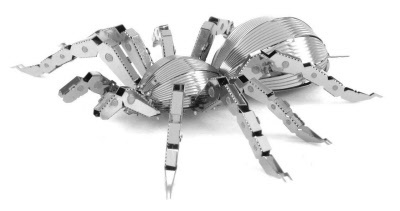 This ornately designed metal sculpture of the tarantula Theraphosidae species. Did you know that there are approximately 900 species of these invertebrates that have been identified? You can find these spiders throughout the United States, Central America, Africa, Asia, Australia, Europe, Spain, Portugal, Turkey, Italy, and suppress as well as South America. They are pretty abundant throughout the world. Now that you know a little bit of information about these invertebrates go ahead and buy a metal Earth Kit by fascinations.